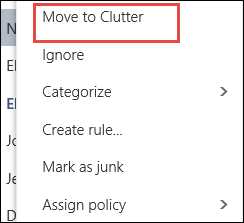 You need to enable/disable Clutter in the Outlook Web App, not the Outlook Client, but it will save your changes across both platforms. On the top right corner of the page, click on Settings and at the bottom of the popup in the "Your App Settings" section, select Mail. You can disable Clutter anytime by unchecking the box next to "Separate items identified as Clutter". If you have the Clutter folder enabled, it starts analyzing your emails based on your behavior. 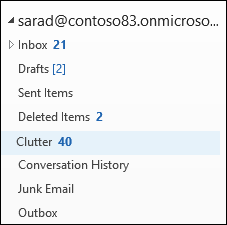 It moves the low priority email messages to a folder called Clutter under your Mailbox. 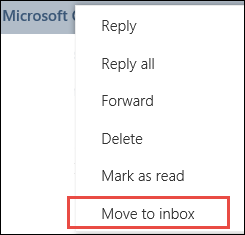 You can view this folder both in Outlook Web App and Outlook Client. If you see a low priority email in your Inbox, right-click the message and choose Move to Clutter, or drag the email from your Inbox and drop it into the Clutter folder. 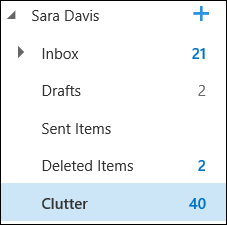 If you see a message that was sent to Clutter by mistake, right-click the message and choose Move to inbox, or drag the email from the Clutter folder and drop it in your Inbox. 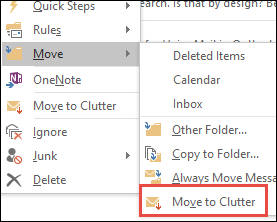 Note Moving an email in or out of the Clutter folder, from any of your devices, is enough to give the signal to the Clutter system that an item is Clutter or not. 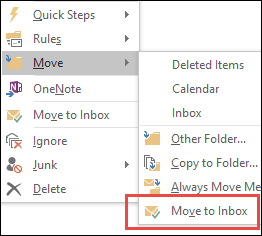 For example, if you move an email to the Clutter folder in Outlook desktop, or the Mail app on your phone, the action gets recorded in the Clutter system on all your mail apps. You don't have to do this individually in each app.